creative index is now union shore: Blog Tip: Back Up Your Blog! 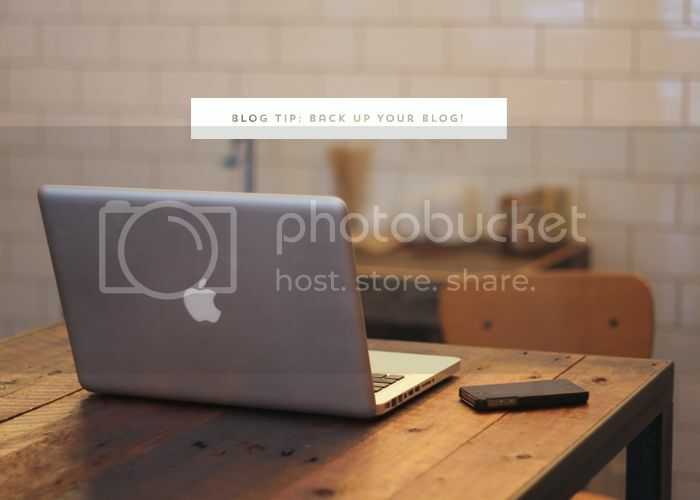 Blog Tip: Back Up Your Blog! What would you do if your blog disappeared? Would you freak out and be sick to your stomach? Because I would. Don't risk losing all that content you've worked so hard on. It's super simple to back up your blog and only takes 5 minutes. This tutorial is for the Blogger platform but I suggest you back up your blog/site regularly, no matter what platform you use. + Go to Template and click on the "Backup/Restore" button in the upper right corner. + If/when you ever need to restore your template, just upload the XML file. + Go to Settings and click the "Other" link. + At the very top of the page, you'll see "Blog Tools." Click the "Export Blog" link. + All your posts and comments will save in an XML file format. + If/when you ever need to restore your content, click the "Import Blog" link (next to export) and upload the XML file. So tell me, do you already backup your blog? Or worse, has your blog ever disappeared?! Eek! Thanks so much for blogging this!!! I was trying to figure it out. I'm backed up now!!! Thanks so much for this, I have never backed in two years! I have just done, it is quick! Surprisingly I don't back up my blog that often. I usually only do it when I'm making big changes to the design because I'm scared I'll accidentally wipe it out. This is a really good idea though. Thanks for sharing, and I love the new look!! Honestly, I rarely back mine up too! It's def been a few months since I have, but this has happened to a few bloggers I know! :( I need to get better at backing everything up! Better to be safe, then sorry! Aaghhh! I totally need to do this and haven't backed up in over a year. First thing on my to-do list tomorrow morning. Thank you for the simple instructions too. Jessica! First of all I love the new design. I'm always so amazed with what you do. Everything is always simple, classic and beautiful! Second, thanks so much for posting this!! I've backed up the template, but I haven't done the posts so I should probably do that! i love your new blog design!! and thanks for this info. i'm always terrified of losing files and such! Oh, yes! I think I have my blog set up to do a back-up once a week or once every 2 weeks. I hope it's doing it okay! It would be sooo devastating if it all disappeared! Oh man, I think I'll die if my blog is dead really. I back my blog up weekly because I've lost my blog once before, back when WP was very unstable and things were easily lost. It's such an important thing to do but I don't think new bloggers really get this advice so this post is awesome! I haven't lately, so thanks for the reminder! I did have one time that Google shut down a blog, and I still have no idea why it happened! Ugh. Fortunately it wasn't something I'd invested a lot of time into and it was before I got serious about blogging. Oh gosh, this is such excellent advice. I didn't know that you could back up posts. I just did it. Thanks for the tip!